Remember the original Command & Conquer? Remember all the units, characters and themes from that game? Well, that classic from the early 90's that spawned over a dozen titles and revolutionized the RTS gaming world has been reincarnated in the C&C Generals Zero Hour SAGE 3D game engine and looks better than ever! Which graphic card is used by you? @Dimension9999 I use a 1GB nVidia GeForce 9500 GT Graphics Card with an AMD Dual Core Processor and I can play C&C 3 on Max details easily with it. @Sweln It may just be the framerate as some maps in skirmish can easily exceed 60FPS as I have fixed up a lot of the Lag Issues. @StalkeR0857 Yeah I figured since Starcraft has volcanoes, why not C&C? Ohhhhh...Seems you having a hard work......Keep making! I can wait to play it! Humm the waterfall animations seems too fast? That volcanic tileset reminds me of Starcraft. 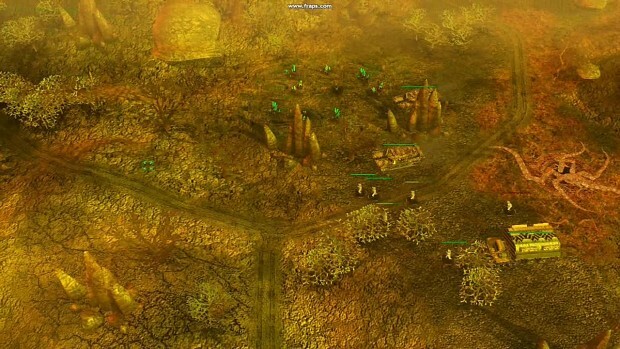 I think it would be interesting to see Tiberium clustered around the lava maybe even a Tiberium spike rising from it since Volcano's bring all kinds of minerals from deep bellow the earths surface I would expect the Tiberium to grow like crazy around one! This is a preview video showing some of the updates that have been achieved for the Mod in the past year since the release of version 1.3 back in December 2009. 6.) Retextured Models & Modified Animations.